If you were reading my post’s early last summer you might remember the gorgeous gold fitflops that Shoetique kindly sent me. If not you can read about it here I lived in those sandals throughout the summer, they are so comfortable I can’t recommend them enough. They have stood the test of time too, and are still like new. Today I’m sporting winter wear from Shoetique A different brand called Gabor. Ankle boots with a medium heel, soft suede and a faux zip fastening that finishes off the style of the boot very nicely. I’m styling my boots today with a Black and Tan theme. Wearing the new fashion length trousers in a camel colour. I keep seeing these shorter length trousers on bloggers and in magazines and really wanted to give them a try. What do you think ? I just don’t pass off that cool-girl look that I’m trying to achieve it’s just not who I am. You have to try these things sometimes right ? I tied in the black boots with the cardigan of black and brown stripes to balance the whole outfit. I chose my Tan bag and Tan belt to finish the look. Off out on a country walk today, It’s nearly November and the weather is sooo good! The boots are ultra comfy, they have a small platform, so although they look like your wearing high heels, they actually feel like you’re wearing boots that only have a slight heel. Style and comfort rolled into one! Oh and there’s a slight change! Straight hair ! It takes ages to do, a lot longer than having it curly but I just fancied a change. Do tell me what you think? Next Post New Special Offer Post ! Your hair looks lovely! The trousers look good particularly with that black white and tan colour way. I've found trousers a bit difficult to wear in the last few years because I like them to be long and not above the ankle. I might write about the trouser dilemma soon! Great boots! You look great, and the straight hair really suits you. Uber chic! I love this whole outfit and the colors are so rich and elegant on you! I totally know what you mean about the cropped trousers this way. I tried them too. I think part of the reason they don't "feel" like us is that we haven't been wearing them for years. Sometimes I think "our style" is really only habit and what we are used to! So my opinion, is this outfit looks fabulous. It may not be the norm, or what you're used to wearing, but it's beautiful and elegant! I have just bought a pair of cropped trousers and am trying to style them, so I understand your perplexity…in any case you did a good job with yours ! Beautiful sweater and accessories ! The black boots are versatile: you will match them to many different outfits !! Your outfit is gorgeous and I really like the ankle boots! I think the pant length would not work on me, but you look lovely wearing this style. So funny. Seeing ourselves in different clothing or with a different hairstyle seems to throw us off. It's not what we're used to. But I think you look very chic and very cool. I love the combo, the stripes on the sweater are done in an interesting way and they look great with the brown pants. And really like the boots, I need a bit of a heel but without the platform it bothers my bad ankle. These look like they would be perfect. Checking them out thanks for the tip! And by the way your hair looks great either way. You're a very beautiful woman. So lovely of you to say that Nikki. I really recommend the brand, these boots have barely been off my feet! Beautiful! I love those boots! And I hear you on the shorter trousers…I keep seeing them, and I love the way they look..but I don't know if I can pull them off! You styled them to perfection and look fantastic! I love black and tan together for fall! Thanks so much for sharing with Fun Fashion Friday! Have a fabulous weekend! Love the whole look . . . the shoes so chic! A brand-new linkup is currently on the blog. I'd love for you to linkup this great post and share your scrumptious style with my readers. Thanks and enjoy the weekend! Thanks for linking up to Top of the World Style. Another great outfit. Back and tan are so great together. One can't believe that it was a style rule not to wear black and brown together. Your outfit proves it is a do! I have never heard of shoetique but as a shoe lover, I think I need to check it out! First off, I have to say love the hair, Laurie! Then, oooh, I love the outfit too! Great combination of black and tan and I do think you have a cool girl vibe in this outfit. The cardigan works a treat with the trousers and you've a great Autumnal outfit. Love your hair Laurie! It really looks great either way. My hair is naturally striaght. Love the combination of browns and black, a rich bag, and those booties look like they are perfect for any outfit! Looks like a lovely fall look! Thanks for linking up! Thought you looked different but couldn't quite put my finger on it. It's your hair! It looks lovely and having gorgeous curly hair gives you two styles to choose from each morning. Lucky you. I am a huge Gabor boots fan and I've never had to repair a pair, even after 10 + year's of use! Your boots look super, I'm sure you will have many years of pleasurable wear. 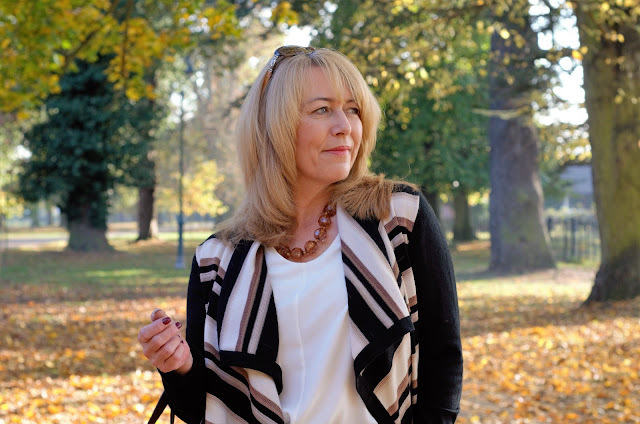 Thanks for linking up to the Ageless Style linkup party! I love this look. The belt is very interesting. Love the boots and the trousers and….Just the hole look! Gabor is a good brand, the shoes and boots have a great passform. Did I mention that I love your trousers! I think I like the curls a bit better. And I love your trousers!!! !😂😂😂😂😂but I really do! Thank you Emma. I can't get used to these trousers though! Super Laurie, Love all these pieces. The trousers look really good one you – good choice. You hair suits you straight, I wish mine would look equally good curly! Love the cropped trousers with the shoes! Oh, I love this look! Your jacket is such a statement piece and was the perfect way to complete your ensemble. Your booties are a fabulous style and look very comfortable. Laurie, you look gorgeous! Love the outfit, but I would much prefer regular length trousers. I would not be at all comfortable wearing those short ones! Your hair looks great either straight or curly, so just go with what's easiest.